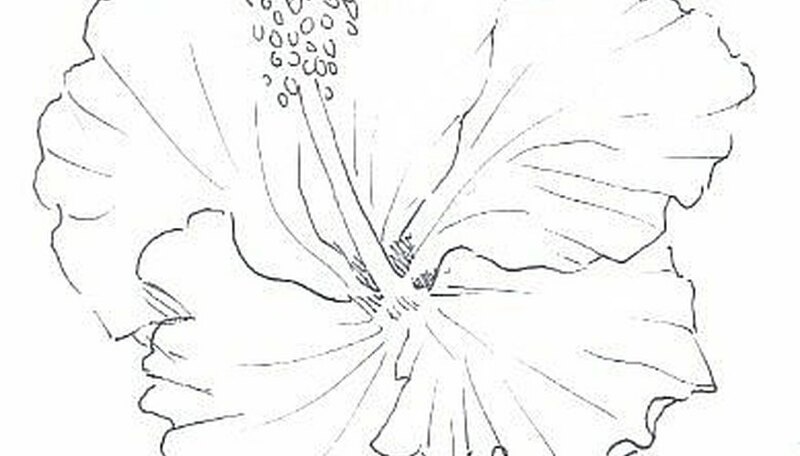 Flower petals have specific features that are challenging until you get used to drawing them. Every type of flower or petal is different. It helps to draw from real flowers, or from good photo references. The more often you draw the same flower, the easier it is to get the shading, colors, veins and details accurate. Look for a photo that shows the flower very large, and do a preliminary sketch on sketchbook paper. Either put the photo reference on your light box and trace it, or sketch freehand. You can enlarge or reduce the sketch using a copier to get it to the size you want your drawing. If you want to copy my sketch, please credit my article when you display or sell your finished artwork. 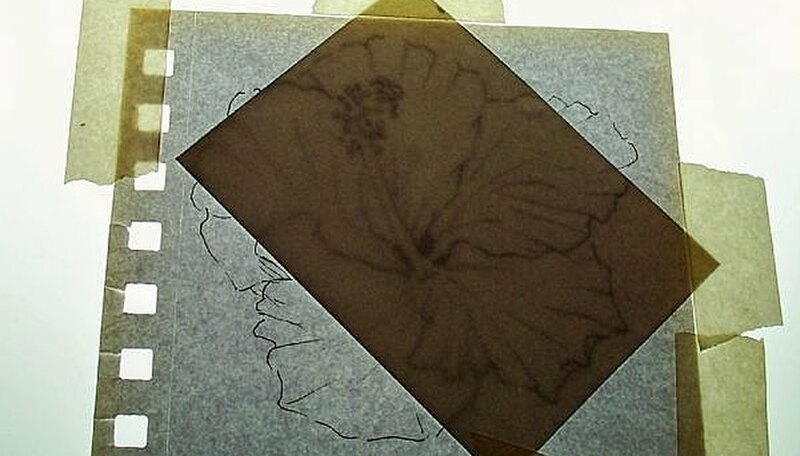 Trace your sketch onto the watercolor paper using your lightbox or by taping it to a sunny window if you don't have one. My drawing is an ACEO, Art Cards Editions & Originals, which means it has to be 2 1/2" x 3 1/2" without a border. If you want to do yours larger, just enlarge the sketch and draw the proportions for your final artwork on the paper before tracing. 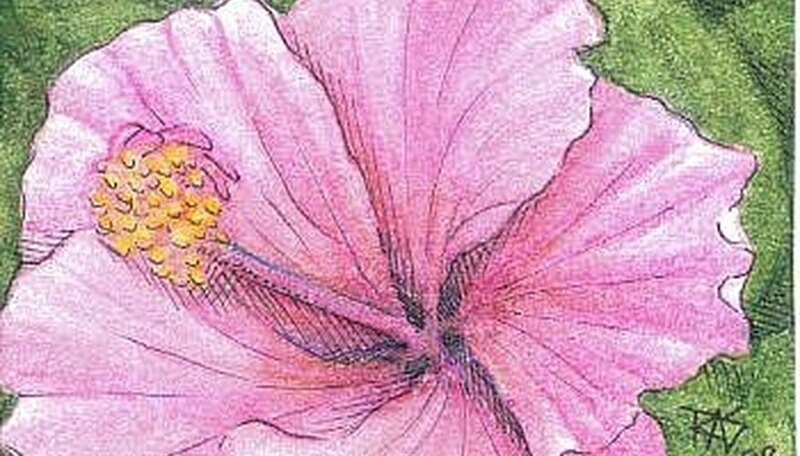 Trace your sketch using the colors of watercolor pencils you want your finished flower to be. 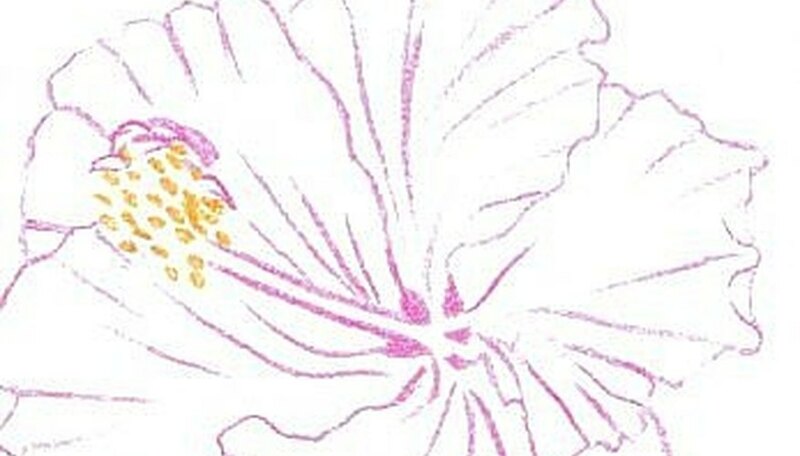 Hibiscus come in white, pink, lavender, yellow, salmon, orange, wine red, bright red or fuchsia, they may even come in purple or blue. Where the pollen bulbs on the stamen are bright yellow, fill them in solidly rather than drawing little circles as I did in the ink sketch. Color carefully around them. I used Magenta for the base color for my hibiscus and Middle Chrome for the pollen, from my set of 24 Derwent Aquatone woodless watercolor pencils. Shade the flower sketch using your original colors in soft tonal layers. Pay attention to the lights and darks in your photo reference for accurate shading. I use soft strokes that go the direction of the veins in the petals to hint at more veins than I've actually drawn, and soften the hard lines of the folds so that they look more rounded and three dimensional. Fill in the background behind the flower with partial leaf shapes, using the reference for ideas. Mix colors freely. I used all my greens, dark brown, Indigo blue and gold in the leaves, and Indigo down in the deepest darks between the petals where they meet the center. There are little gaps between the petals at the base and I wanted to show how they're actually holes between the petals. Now it's time to start washing and turn that good drawing into a great painting. Start with the hard part, going around the pollen. Using just the point of the brush, touch a dark pink area or scribble some magenta on a scrap to use for a palette. Carefully paint around the pollen. Let that dry thoroughly. Then wash the brush and dot the pollen to dissolve it without migrating paint over the edges. Be careful to let one area dry before doing the next if they are not similar colors. 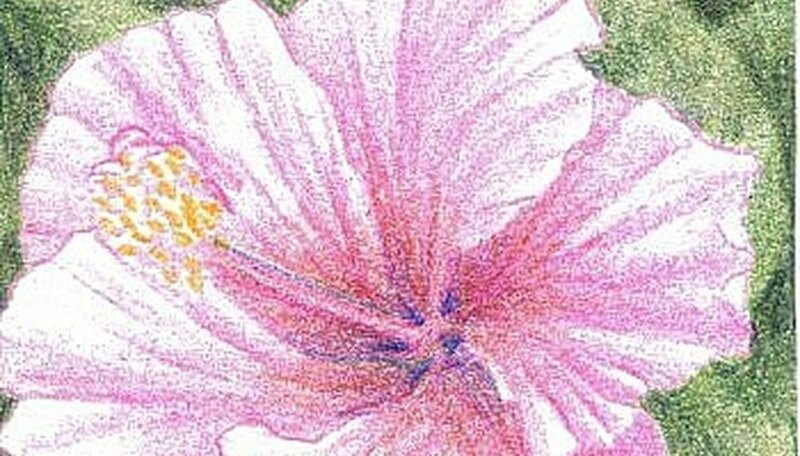 Use the medium brush in broad areas like the petals, and the small one for the centers around the hole. Move the paint around with the brush to strengthen darks and soften lines. Once everything is washed, if you see too many veins vanishing, draw new lines in lightly with the sharp point of the magenta pencil. Once the painting is completely dry, sketch into the deepest darks with a very fine point pen like a Rapidograph technical pen, a Pigma Micron size 005 or 01, a Prismacolor Fine Point pen size 005. Don't outline everything like the original pen sketch, just crosshatch slightly in the deepest darks and add accent lines to heighten key details. Use quality student or artist's grade art supplies even if you're a beginner. You'll get better results with them, it takes an expert to use cheap children's scholastic supplies effectively and the resulting art may fade or yellow rapidly. Many schools have opaque projectors for copying sketches, maps and school materials. If you are a teacher, student or parent, you can ask to borrow the opaque projector to transfer your sketches. Be sure to bring your own supplies. Good lightboxes or light tables can run hundreds of dollars, but the Artograph LightTracer is inexpensive and convenient if you're working 9" x 12" or smaller and don't need to trace large posters. Lightweight and lap sized, it can make tracing easier if you prefer drawing in a squashy armchair to sitting or standing at a drafting table. Don't point your brush with your mouth, some pigments are toxic. Check for a "nontoxic" ASTM label on your set of watercolor pencils. Happily, most watercolor pencils are nontoxic but some artist grade brands use toxic pigments.